Can you talk about your writing process and how it developed over the years? Do you have any strategies for plotting or revising? What’s your favorite piece of writing advice to give new writers just starting out? If the concept and hook for my story are quite classic, what tips would you have for putting in unique touches? What advice would you give an author who gets comments about a need for deeper worldbuilding in their story? How can we get all that stuff we know about the world onto the page…without info dumping? Second, what’s your best revision tip? How do you know when to trash a novel and move on to a new project with more potential? When you began writing, how did you hold true to your vision for your stories in the face of rejections? What helped you to believe you had something brilliant to say? How did you celebrate your first book? Thanks! Do you have tips on how to make your world feel as important as your characters? Any insight into using a diverse range of characters in an ensemble novel? Writing from one’s personal perspective is fine – but limiting. Yet writing from other perspectives seems to make one worthy of attack who feel that their stories are being usurped by others. Where’s the middle ground, especially in fantasy? Do you have tips on naturally seeding in information about the world that will come into play later? Hi! I’m a really big fan of yours, especially of your Circle of Magic books! As a new writer, I have this anxiety: I want to make my first book as perfect as possible, to put my best foot forward when I introduce myself to the world as a writer. Do you have any thoughts you can share on that, based on your own experience as a prolific writer? What are some suggestions to avoid the “info-dump” when it comes to worldbuilding? Your books have such vivid settings, but they grow so naturally rather than having the reader be told what to expect in an info dump. I’m a big fan and thrilled you are here! When writing a new novel, do you like to outline first or are you more freeform? I absolutely love your books and have been reading them since I was thirteen-years-old. You have been one of my biggest sources of inspiration for wanting to write my own stories. Do you plan well in advance the different series you want to do in the same world? How do you keep the various character histories straight? What’s your process for creating a series? How do you keep track of all the details of such an expansive world? I’m worried my concept isn’t unique enough to attract an agent or sell in the market. What can I do? What are your thoughts on Science Fantasy. I heard it’s not sellable. When worldbuilding for fantasy, how should a writer invent new details to the world without having them shoehorned in or come out-of-nowhere? Will you be attending BookCon this year? 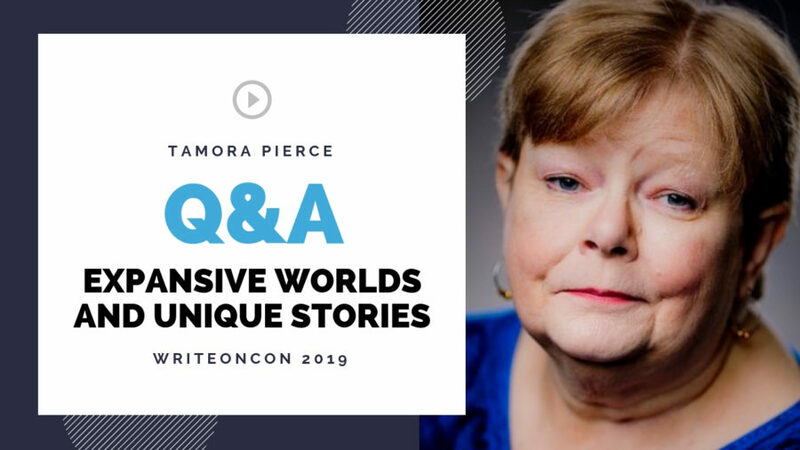 Thank you, Tamora, for your perspective on writing and life as a writer. I so enjoyed learning from you.